By layering scraps (4 different patterned papers), I created the base for this layout. I then cropped my photos down to eliminate blank space in the photos. I selected the one of Kevin showing off the sparkling cider to highlight by double matting it. Then I arranged my photos. I tucked the remaining pieces of the Maya Road transparency doilies out from behind the photos in three spots (forming a visual triangle). Then I layered my mixed title (October Afternoon stickers, Maya Road "Merry", and Jillibean Soup corrugated alphas) over a couple of the photos. To complete my page, I cut up one of the windowpane chipboard pieces to make photo corner for the outside edges of a few of my photos. 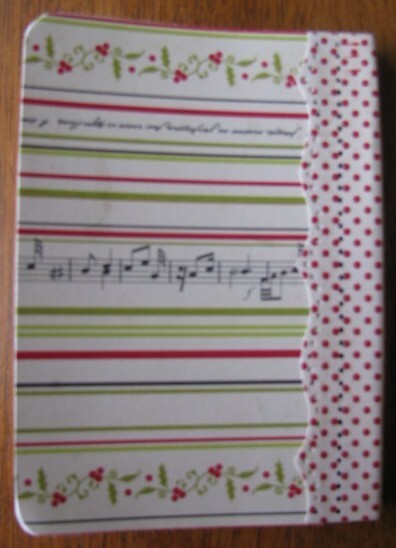 And I used a striped piece of patterned paper to make journaling strips. 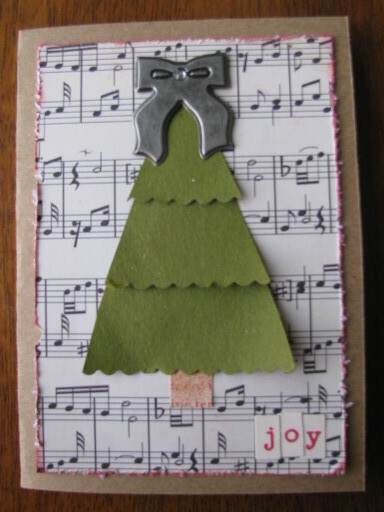 My friend Mel is the greatest card maker I know. I channeled her while making this card. OK...maybe that's not the right thing to say...I was "inspired" by her use of a tree on one of her recent layouts (here). I also pulled out an extra mini comp notebook I had on hand. 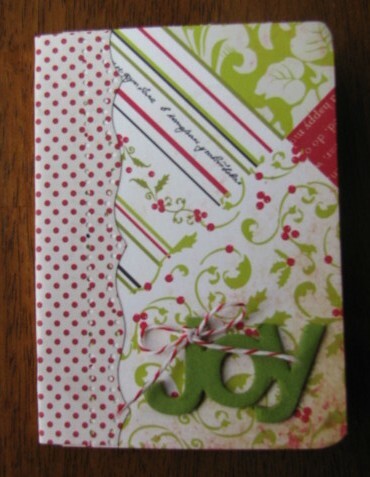 Covered it with scrap paper and added a "Joy" chipboard title. The word came on a keychain, so to cover the hole in the "j" I tied on a piece of baker's twine. Here's the backside of the notebook. I used a Martha Stewart border punch on the polka dot paper. It's almost too late to use this notebook this year, but it will find it's way into my purse next Christmas. I always seem to have a mini notebook in my purse. It's a great way to keep up with wishlists and budgets over the holidays! My kit is now gone. But, once I have photos of the boys printed, I'll have a couple ornaments I started to share, too. Stunning creations Amy...you rock any kit. 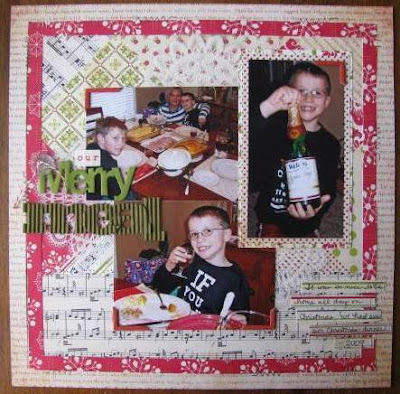 gorgeous layout, Amy! 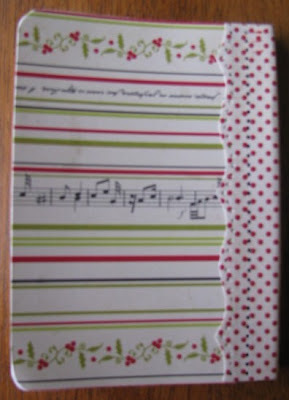 Great idea with the notebook, too... I was thinking of making something similar for my nieces and nephew.